Here at Barber of Sheffield, all of our opthalmic needles are produced to meet the highest standards required for modern micro-surgery. Our commitment to continuous research and technical development means that we have created a premium product range of ophthalmic needles. They combine outstanding quality with optimal levels of functionality. As a result of these manufacturing developments, we can now deliver our customers a product that is combination of a high strength needle with a finely honed point which is also extra sharp. Barber ophthalmic needles are formed from the highest quality maraging steel. This conforms to Custom 455 regulations. These needles are carefully age-hardened to give them maximum strength and ductility properties once they have been heat treated. • Duly age-hardened so as to give optimum strength & ductility after heat-treatment. 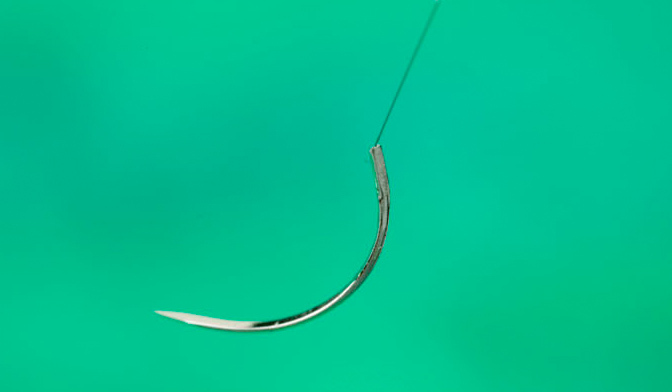 This type of needle retains the sharp cutting edge for an extended amount of time, as well as a guaranteed low penetration force. This helps to minimise the level of trauma to the tissue due to precise controls of point geometry. Flattened needles with spatulated point. Triangular needles with reverse cutting point. We can give you options on how you would you like your needles supplied. Barber of Sheffield can either deliver your needles packed in bulk orders or give you the choice of having sutures attached to the needles. All needle products are supplied in a sterile condition, carefully packed individually. Each item is wrapped separately on a foam winder, with over 100 winders per box. If you prefer a different packing or shipment method, we will be happy to accommodate your specific requirements.